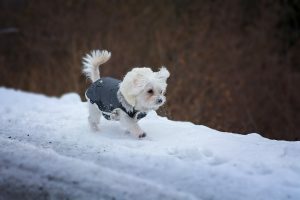 Pets may be exposed to de-icing products that have been applied to sidewalks or dog runs or that have been improperly stored or spilled. The most common clinical signs are vomiting, diarrhea, salivation, depression, and loss of appetite, disorientation and increased thirst. In extreme cases seizures and even death can result. Inducing vomiting may not be advised if the products contain very corrosive substances such as large amounts of potassium chloride which will damage the mucous during vomiting. While activated charcoal is considered to be the universal antidote – it does not absorb the salts in deicers. Following topical exposure, bathing the pet is advised. Monitor the pet for gastrointestinal signs, dehydration, and electrolyte imbalances. While safer pet alternatives to deicing salts may be sand or kitty litter neither of those cause ice to melt. They are messy and may even make an icing problem into a bigger headache. A better alternative is use newer potentiated deicing blends. Some of these products cut the amount of deicing salt such as magnesium chloride by two thirds while also being stronger, faster, safer and easier to use.